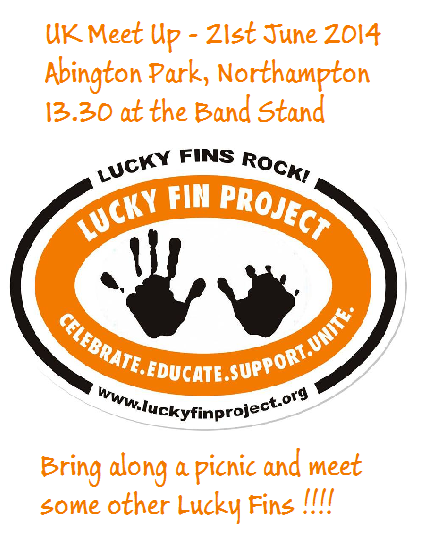 The “Lucky Fin Project” set up a UK group on Facebook. The group has arranged a meet up on 21st June 2014. Lucky Fin Project is an organisation bringing people together with limb differences. Inspired by “Finding Nemo” Lucky Fin Project is growing and going from strength to strength. It’s a chance to meet other families with limb differences and for the kids to all say hello. If you can make it we highly recommend it! There’s nothing better than a natter with someone who’s been there and can really listen or can offer some great advice. The U.K. arm of Lucky Fin is growing strong and the Facebook Group are very supportive of each other. You can join the group if you have a Facebook account. But if you don’t not to worry we’ll make sure we keep you up to date at PIP-UK with upcoming events and information.